All construction aggregates are available. We are resellers of most producers in the region. We research for the lowest cost source for your project using a combination of material price and delivery cost. Contract hauling by the hour, by the ton or by the load. Contractor owned materials or materials provided by us. Heavy duty dump bodies for concrete and asphalt removal. High lift tailgates for clearance of hard to handle waste such as tree roots. Free or low cost dump sites for recyclable waste such as concrete and asphalt. Decomposed granite with stabilization additive for pathways, tracks and other commercial uses. Experienced handling of water treatment waste. Waste water basin cleaning and disposal of sludge. Requirements for aggregate with specifications by ASTM or Cal Trans can be identified and located. 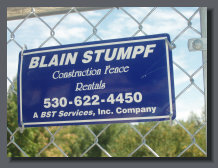 Sister company BLAIN STUMPF Construction Fence Rentals provides temporary security fencing for construction sites, emergency response for fire damaged structures, events and most any other need to limit access.